Apryl here with the Fotobella Design Team. Are you ready for a dose of Holiday Cheer? 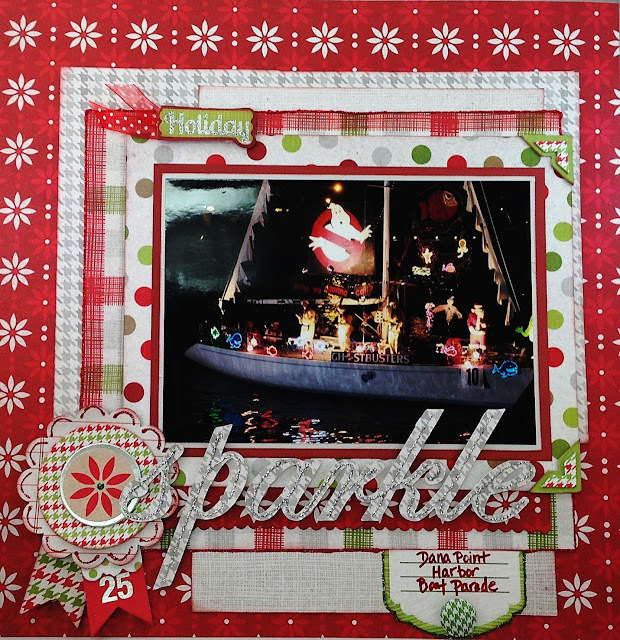 I’m here to share several layouts I put together with the We R Memory Keepers Yuletide-I Want It All Bundle. 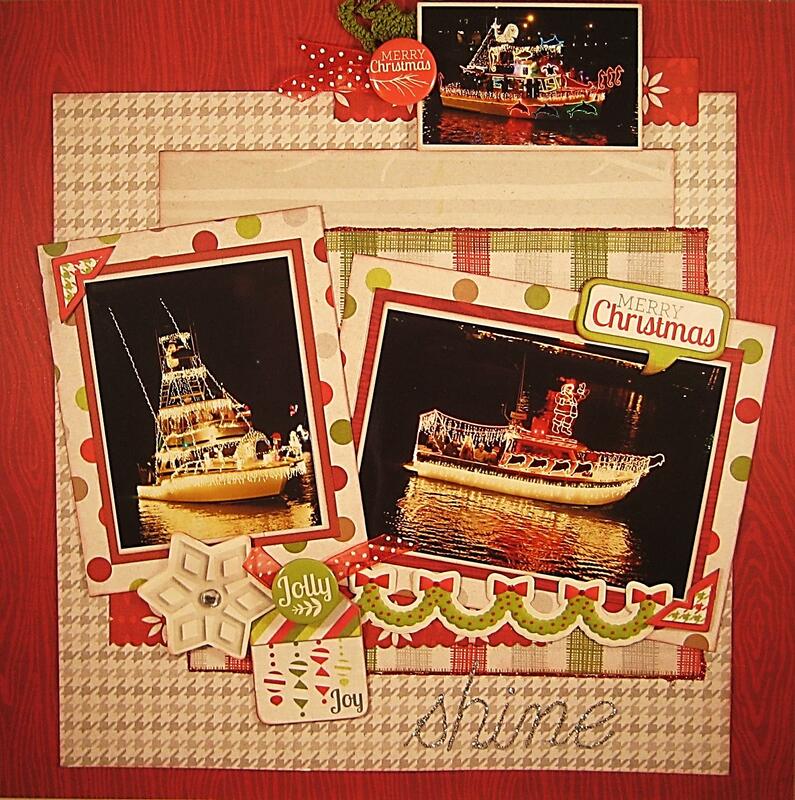 Yuletide is a beautiful Christmas line full of traditional Christmas colors and designs. 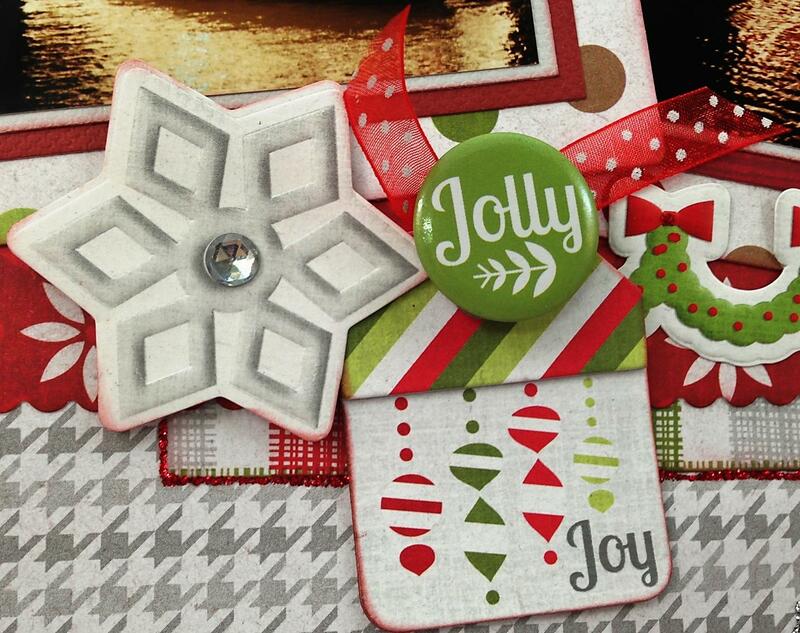 The “I Want It All” Bundle is packed with fabulous paper and tons of embellishments! Believe me…you want it ALL! After spreading the entire bundle contents out on the table, I set to work creating an eye-catching 12x12 layout. I wanted a layout that matched the festiveness portrayed in my photo. I selected the ‘Poinsettia’ paper as my background and began layering patterned paper behind my double matted photo in a staggered design. One of the techniques you’ll find I frequently use is inking the edges of my paper. I LOVE this look and inked all of the paper in this layout using red ink. Next is the embellishing, always a FUN creative process for me! I enjoy taking the embellishments I have and combining them to make new ones. 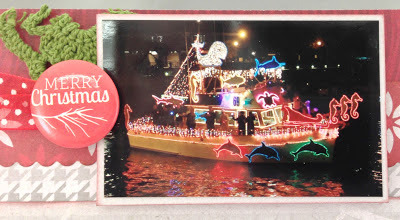 The photo portrays my favorite lighted boat in the boat parade so I wanted to signify that by creating an Award Ribbon embellishment to place at the bottom left of the page. I used the chipboard stickers and paper to do this I cut a pennant out of the red/green ‘hounds tooth’ paper to match the Dec. 25 pennant. Using a scallop circle punch I created the background piece of my ribbon with the lined paper from the ‘Cards’ patterned paper. For the “holiday” title at the top left of the photo I cut out the word “holiday” from the Card patterned paper and matted it with Dark Red cardstock. I attached the red ribbon behind the “holiday”. I cut out the title “Sparkle” using my Cricut and Teresa Collins Dec. 25th cartridge, popped it up off the page with pop dots to add dimension, and then using Silver Stickles, wrote the word “Sparkle” through the center of the word die cut. To include a journaling section in the layout I selected the ‘Twas’ Tag, punched out the inside and cut off the saying. I attached it below the photo on the bottom right with a fabric brad. This placement helped to create balance to the layout as well as a small space for journaling. Lastly, to add my own sparkle to the page (another thing I LOVE to do! ), I used Xmas Red, Green and Silver Stickles to the embellishments. I also like to use the Stickles around the edges of the paper and/or embellishments to make them stand out. If you are like me, and like to create 2-page layouts, here is a second layout to go along with the first one. 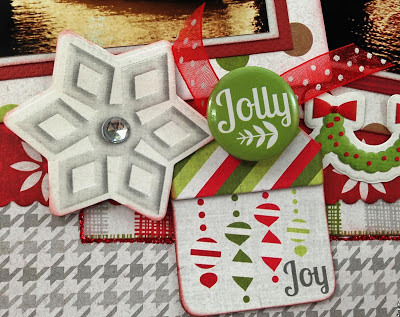 The cluster of embellishments in this layout include the chipboard sticker ‘Joy’ tag, the embossed ‘Snowflake’ sticker, ‘Jolly’ mini badge and sheer red ribbon. The word “Shine” is written with Silver Stickles to match the “Sparkle” title on the opposing page layout. My favorite part of this layout is the small picture I placed at the top right of the page. The idea here was to incorporate a small photo as part of embellishing the page. I cropped a photo down to 3”x 2”, matted it and popped it off the page with pop dots. I cut one of the crochet doily embellishments in half and place it behind the photo. Then, I layered the ‘Merry Christmas’ mini badge and ribbon on top of that. I used the same layering of patterned papers, photo matting, stickles technique and page placement of embellishments as in the first page so that this layout would work with the first one as a 2-page spread. Are you in the holiday spirit now? I know I sure am! Visit Fotobella.com and add We R Memory Keepers-Yuletide I Want It All Bundle to your shopping cart and get to scrappin’ those holiday photos!